Did you know that Dynamics GP’s return on investment is 30 times higher than QuickBooks? Dynamics GP is the premier upgrade to existing and prospective QuickBooks customers looking for a solution running within the corporate firewall or online. Dynamics GP is targeted to small and medium sized businesses and has the highest functionality to price ratio of any accounting system. Creating consolidated financials for multiple companies and multiple currencies is difficult and time consuming with QuickBooks. Dynamics GP allows you to quickly set up an unlimited number of companies and currencies with powerful one-click single or consolidated financials. QuickBooks cannot setup a chart of accounts for proper financial and operational reporting to slice and dice business data. Dynamics GP supports 66 alphanumeric characters and 10 segments for the account framework and can be extended via an unlimited number of analytical dimensions empowering organization to keep track of financial and statistical data with complex allocations for in-depth top-bottom and bottom-up analysis. A major security flaw in QuickBooks allows anyone to delete or adjust a transaction without leaving a trace. QuickBooks gets excruciatingly slower as the database size grows and more users login. Dynamics GP allows an unlimited number of users to login concurrently without any performance degradation from a data entry or query and reporting perspective. QuickBooks is only capable of processing a few hundred transactions a day. Dynamics GP is able to process and data mine millions of transactions a day. QuickBooks must be switched to single user mode for data import activities. Dynamics GP can import data and transactions from thousands of 3rd party applications while users are working within the system. QuickBooks is not easily accessible – it must run via Terminal Server / Citrix or on a local laptop. Dynamics GP Online runs in the cloud and accessible via any device and any browser. QuickBooks does not integrate on-premise and online front-office and back-office business processes. Offers full and seamless integration with Office Productivity Suite (Excel / Word / SharePoint / PowerBI). Integrates with major CRM vendors (Sugar, Microsoft, Salesforce) for full Opportunity to Quote to Cash automation. Has a very powerful built-in interface designer to connect to any operational or financial system with minimal effort. QuickBooks cannot be adapted to handle complex business processes. Dynamics GP is the most mature and established business process management system developed over the course of 20 years with 80 integrated modules covering all vertical and horizontal industry specific business processes. Dynamics GP has a modern Service Based Architecture and source code and tools to easily expand its capabilities and create interfaces to 3rd party applications either on-premise or in the cloud to minimize double-keying of information. QuickBooks Online or local QuickBooks data cannot be easily exported due to its proprietary flat file architecture. Limited reporting capabilities aren’t giving you the visibility and insight you need to run your business. Multiple departments or lines of business are preventing you from centralizing and integrating your data. You find yourself unable to confidently and consistently comply with regulations for monitoring and securing your financial data. You experience frustrating and unacceptable delays in menus, reports, or navigation. You have had to sacrifice transaction history or master records to improve system performance. More users need to access the system than are currently allowed. You are concerned about the lack of security and compliance features. The whole point of an accounting software solution is comprehensive and actionable financial reporting. Microsoft Dynamics GP includes a greater number of standard reports than QuickBooks as well as the ability to create any type of customized reporting you might need. While both Dynamics GP and QuickBooks offer a range of Microsoft Office integration features (e.g. 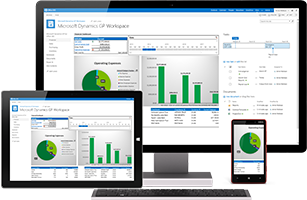 exporting reports directly to Excel or Word, emailing reports and documents through Outlook, etc…), only Dynamics GP offers advanced integration via SmartTags and Workflow that allows users within Outlook, Word, or Excel to view data from Dynamics GP without having to log in and manually look up the data. One of QuickBooks’ major shortcomings is its lack of scalability. With a maximum user cap, inability to adequately track multiple entities, and declining performance as the database size increases, QuickBooks is simply unable to keep up with the demands of your growing business. Dynamics GP, on the other hand, supports unlimited users and includes multi-entity tracking capabilities. Its superior scalability allows it to accommodate your business needs as you grow – without sacrificing performance or functionality. 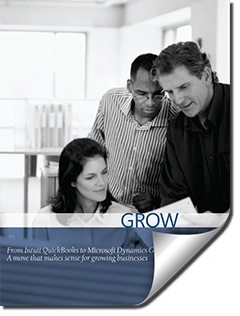 This short guide explores several of the key benefits of migrating from your existing QuickBooks solution to Microsoft Dynamics GP. MIG & Co. has helped companies across the country save money and improve the efficiency of their business processes by upgrading to Microsoft Dynamics GP. For more information about how we can help your organization, click here to contact us or call 855-644-2677.